It concerns risk taking, and although the statement may seem to be trivial, it is far from it. It is an important concept. Don’t expect to make more money for taking risk; just know you have to take additional risk to make more money. If you don’t understand the difference, you should not be taking risk. One of the basic concepts regarding investing is that there are no free lunches and that you, the investor, must take some risk in order to earn a return on your investment. If you are a very skilled trader, you may be able to get away with taking very little risk. However, for the vast majority of investors/traders, we must take on additional risk when we seek to earn a higher profit. I hope that makes sense. If you were able to earn a high reward on your investments with very low risk, then almost every investor on the planet would go after those rewards. Usually, no further discussion is required because we all understand when many people go after the same investment product, then there are often those who are willing to accept a slightly lower reward. That in turn drives down the overall reward available to investors. To understand why this is true, just imagine a $100 bond that returned $10 every year. You love that 10% annual return. But another investor may we willing to accept less and may bid $105 for that bond. When that happens, you can no longer buy the bond for $100. The price is now higher and the reward is now less. The process continues (i.e., the cost of the bond increases) until equilibrium is reached and no one is willing to pay a higher price. By the time that happens, the bond could easily be selling for $120 and the annual return would be 8.33%. THE MAJOR POINT IS THAT EXTRA RISK DOES NOT GUARANTEE ANY EXTRA REWARD. IN FACT THERE MAY BE NO REWARD. Imagine a careless, inexperienced trader adding risk to his/her portfolio with the expectation that it will lead to greater gains. Using the above bond example, the fact that the business had to pay as much as 10% to sell the bonds initially suggests that the company may never be able to repay the debt. Financially sound companies do not have to pay so far about current market rates when selling bonds. The fact that this company has to pay so much in order to attract lenders says a lot about the high risk involved when lending money to them. It's great to earn $10/year per $100 investment, but if the company defaults and you never get back any of the $100 invested, that is an example of no reward. "SELL TATAMOTORS FUTURE BELOW 336 TGT 334.5/332.2 SL 338.9"
"BUY NIFTY 7500 CALL@ 154 TGT 179/194 SL 128"
Whether you are a trader or an investor, your objective is to make money. And your secondary objective is to do so with the minimum acceptable level of risk. One of the major difficulties for new option traders arises because they do not really understanding how to use options to accomplish their financial goals. Sure, they all know that buying something now and selling it later at a higher price is the path to profits. But that is not good enough for option traders because option prices do not always behave as expected. For example, experienced stock traders do not always buy stock. Sometimes they know sell short hoping to profit when the stock price declines. Too many novice option traders do not consider the concept of selling options (hedged to limit risk), rather than buying them. If you can measure risk (i.e. maximum gain or loss) for a given position, then you can manage risk. Translation: Traders can avoid nasty surprises by knowing how much money can be lost when the worst-case scenario occurs. · Holding a position for a specific period of time. Unlike stock, all options lose value as time passes. The Greek letter "Theta" is used to describe how the passage of one day affects the value of an option. · Delta measures how a price change -- either higher or lower -- for underlying stock or index affects the price of an option. · Continued price change. As a stock continues to move in one direction, the rate at which profits or losses accumulates changes. That is another way of saying that the option Delta is not constant, but changes. The Greek, Gamma describes the rate at which Delta changes. This is very different for stock (no matter the stock price, the value of one share of stock always changes by $1 when the stock price changes by $1) and the concept is something with which a new option trader must be comfortable. · A changing volatility environment. When trading stock, a more volatile market translates into larger daily price changes for stocks. In the options world, changing volatility plays a large role in the pricing of the options. Vega measure how much the price of an option changes when estimated volatility changes. I prefer to begin discussions about learning various option strategies with Writing Covered Calls because it is easy to understand and because it will feel natural to stock market investors. · Long (that means you own) 100 shares of stock. · Short (i.e., you sold) one call option whose underlying asset is that same stock. WHY BEGIN WITH THIS STRATEGY? Although it is not true for every new option trader, most people who come to the options world have some prior trading experience -- specifically, buying and selling stock. Writing covered calls is an extension of that investment strategy. I recommend beginning an options education with this strategy for one basic reason: It is a natural extension of something that most new option traders are already familiar with (buying stock). That makes it much easier to glide into using options. This is not the appropriate space to talk about whether an individual investor is better off choosing individual stocks or sticking with index funds or specific exchange-traded funds (ETFs). I have a deep dislike for traditional mutual funds because of their steep sales charges (loads and/or redemption fees) and excessive management fees. If you are someone who already invests in individual stocks, then the strategy described below is likely to be very useful during the early stages of your options-trading career. 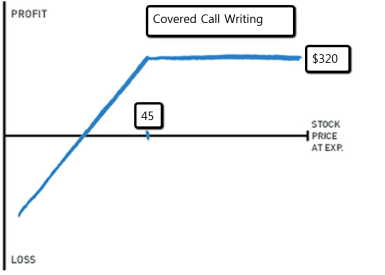 Covered call writing (CCW) is a method for reducing risk associated with owning stock. Stockholders may earn a very large profit when the stock price soars, but they are subject to large losses when the stock price tumbles. If you prefer to hedge that downside risk, then selling (writing) one call option for each 100 shares of stock owned is an efficient hedging method. WHY IS A COVERED CALL A HEDGED POSITION? As a reminder, when you sell a call option, the buyer is granted the right to buy your stock (at the strike price) at any time before the option expires. Therefore, if the stock is trading above that strike price when expiration arrives, the call owner will exercise her rights to buy the shares, and you are obligated to sell. Profits are limited because you cannot sell your stock at any price higher than the strike price as long as you remain short that call option. In other words, you sacrificed the possibility of selling stock at a higher price in exchange for the cash premium that you were paid when selling the call. If you find yourself thinking along these lines [placing a wager that recovers lost money and gets you back to break-even status is so important, that taking extra risk is acceptable], then don’t worry, you are like the majority of people in the world today. Just remember that though it can be very tempting to take a big risk in order to break even, that risk might put you much further in the hole. Before you take that gamble, think very seriously about the consequences of losing. If you can consider it rationally, you will realize that it’s much better to stop before you do further damage. Sometimes it’s better to accept a loss and walk away—much like sunk money. It is very difficult for most people to walk away from a situation in which money has been lost. The temptation to continue playing the game is so strong -- not only for financial reasons -- but because it is psychologically unsatisfying to end the game as a loser. Getting back to break even is almost addictive. In different language: Consider this scenario: You play poker, bet at the racetrack or invest in the stock market, and find yourself losing $100. You can walk away or continue to play. For most people, the possibility of recovering that $100 is so tempting that they may wind up losing far more money than they can afford to lose -- just in an attempt to recover losses. This is the important part that is difficult for rational people to recognize: When people make an investment, earning $100 has a certain amount of pleasure associated with it. However, if they first lose $100, then earning $100 is far more satisfying -- despite the fact that it has the same financial value. "Not losing" is more satisfying than "winning" -- and that may lead to taking more risk than is prudent. When money has been lost and cannot be recovered, there is nothing that can be done. That is the sunk cost. There is a type of option that is not offered by the "regular" options exchanges (such as CBOE or ISE). It's the binary option. Binary options are very easy to understand. The gambler (sure, there is an effort to describe players as stock-market investors, but trading binary options is gambling) places a bet. It works like this: Some future event will either be true or not true -- and you can take either side of that bet. Another way to state the gambling proposition: Your wager will be worth $100 or $0 when the option expires. There are no other choices. If the event comes true, those who bet on "come true" can cash in their wager for $100. Those who bet it would not come true lost, and their "investment." is worth $0 (i.e., it expires worthless). For example: "The S&P 500 Index will be up more than 6.00 points today." In the morning, before the market opens, let's assume that the futures markets are neutral. In that scenario, it is more likely than not that the proposition will turn out to be false because the index rises by more than 6 points less than half the time, or "not true" when the day ends. Thus, people who want to wager that the proposition will come true will get a little bit better than even money odds. Those who bet it will not be true must accept odds of less than even money (i.e., they can win less than $1 for each $1 wagered). Hillary Clinton will be elected president of the USA in 2016. The Chicago Cubs will play in the World Series in 2016. It's very easy to understand how binary options work. Most people like to predict things. When you have a strong hunch, it is tempting to place friendly bets with friends. Experienced, sophisticated investors have a huge advantage over beginners. One of the prime reasons is that the novice tends to jump from one strategy to another, taking advice from whomever has a hot hand. What those new investors fail to understand is that past performance is seldom worth much in predicting future performance and thus, those who have recently performed well tend to do poorly as soon as market conditions change. Instead of following an advisor who made money last month, last week, or yesterday, it makes far more sense for each investor to adopt a long-term basic methodology for putting his/her money to work. One of the best ways for investors to have a less rocky ride -- as markets soar and plunge -- is to use options as a risk-reducing investment hedge. 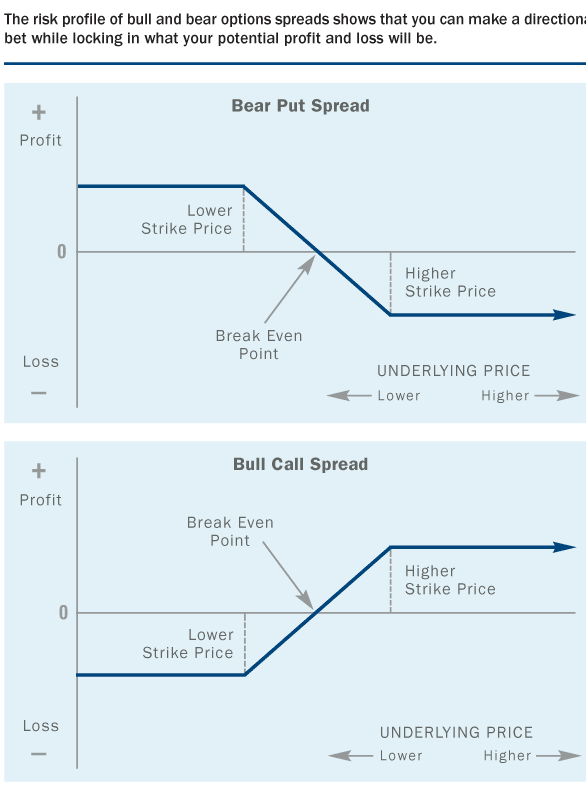 Option prices are based on several factors, such as the stock price and the strike price of the options. However, the most important factor in option pricing is the expectation of just how volatile the market is expected to be in the future. When markets are calm or rising, most traders see little reason to expect market volatility to suddenly increase. For that reason, there is no special demand to buy options, and the supply is sufficient to match the demand. As a result, option premium (price of options in the marketplace) makes it painless to buy options. The problem is that, most traders/investors see no need to own options when markets are calm. When markets are falling, investors tend to get nervous. Because markets (on average) fall faster than they rally, whenever any decline threatens investors with large losses, (think late 2008 or Jan 2016), there is suddenly a demand for put options. Unfortunately for people who want to buy those options, the supply diminishes and it becomes necessary to pay much higher prices to get any options. There are two reasons for that. First, as stocks decline, puts are worth more. (Think about a stock that falls from 90 to 85. The right to sell stock at a specific price, a put option, is worth more when the stock is 85 than when it is 90). Second, fear that markets will become more volatile and that the decline will continue makes people raise their volatility estimates for the future. And volatility plays a very large role in the price of options. Those who wait to buy options until a decline is well underway are forced to pay big prices for their put options. And the price increases are not trivial. Using the CBOE Options Calculator for a stock priced at $100 per share, and paying no dividend, compare the estimated future volatility (referred to as the implied volatility of the option) of put options vs. the calculated fair value of the option. The bottom line for investors who want to own put options as part of their portfolio, is that waiting until you need the puts can be very costly. That's especially true when the decline begins suddenly and demand overwhelms supply. No one can argue with the fact that we’ve seen extreme volatility in the stock market over the past week. At times like this, it’s not uncommon to feel fear and panic. We’re all human and too many of us have lived through challenging financial crises in the past. While I can’t predict the future or tell you definitively that everything is going to absolutely be alright, I think it’s critically important to keep a few things in mind during this time. First, it’s important to understand why the stock market is acting this way. Fundamentally, the U.S. economy is doing well. But due to a confluence of events including fears of a slowdown in China, currency devaluation from emerging market countries (China, Vietnam, Kazakhstan, etc. ), and uncertainty about the Fed’s pending rate decision, the market has seen a huge sell-off. In addition to these events, our market is finally nearing correction territory, and this is a correction that is long overdue. Corrections are a lot like a circuit breaker. They usually occur when a hot market gets hit with worrisome news- such events cause the market to pause and fall back as institutional and individual investors reassess their positions based on the new information. These respites are actually good for the market. Looking back to historical data beginning with the year 1928, the market typically undergoes a five percent correction about every 10 weeks, and a 10 percent correction every 33 weeks. Our research shows that the market has not seen a full 10% correction in 46 months, which is the third longest in history, so we are definitely due. The iron condor is a strategy that can be a good introduction for beginning options traders to option selling. It can be a relatively safe way to sell options because you can’t lose on both sides of the trade. 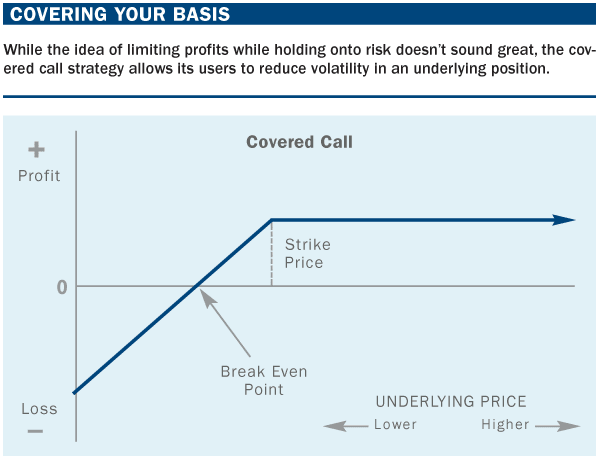 Here, you pick a likely trading range for an underlying asset and sell out-of-the-money option spreads around that range, “If you collect a total premium of $2 for selling two $5-wide spreads – both an out-of-the-money call spread and an out-of-the-money put spread, your total risk is only $3 because the commodity can’t go through both spreads at expiration. You have spread the risk across a wider range of possible prices. If your trading range thesis changes or volatility explodes and threatens to put one of the spreads in-the-money, you can exit one or both spreads at any time. Collecting $2 against $3 of risk offers you a potential return on risk of 67%”. The market outlook for the iron condor is neutral. “You’re trying to be strategic with your use of leverage. You’re trying to be systematic and probability minded, looking at what the best odds in the long run [are] if you did this consistently,”. “A trader who enters a short iron condor is looking to profit from a range bound underlying asset. As long as the underlying asset stays within the inside strikes by expiration, the trade will be profitable. If it moves outside of the inside strikes by expiration, the trader will take a loss, which could be as high as the difference between the sold call/put and the purchased call/put”. A trader who enters a long iron condor is looking for the exact opposite, or, a large move in one direction or the other by expiration. As with any type of trading, with beginning options strategies, having a trading plan and having an exit strategy are crucial. “Everybody has a plan for when to get into a particular stock or index, but few think it through to the point of when to take profits or cut losses”. another strategy used in options is calendar, or time, spreads. In a calendar spread, you establish your position by entering a long and short position at the same time on the same underlying asset, but with different delivery months. The point of this strategy is, time decay happens much more quickly the closer we get to expiration. The theory is that when you short the front-month option, you’ve got that quickly-evaporating time premium working with you, faster than the decay in the further out option that you bought. “Just like the call and put spreads, you’re paying a debit for the spread and the further out you go in time; the bigger that debit’s going to be. You’re looking for a stock at expiration to be at the strike that you have put this spread on”. 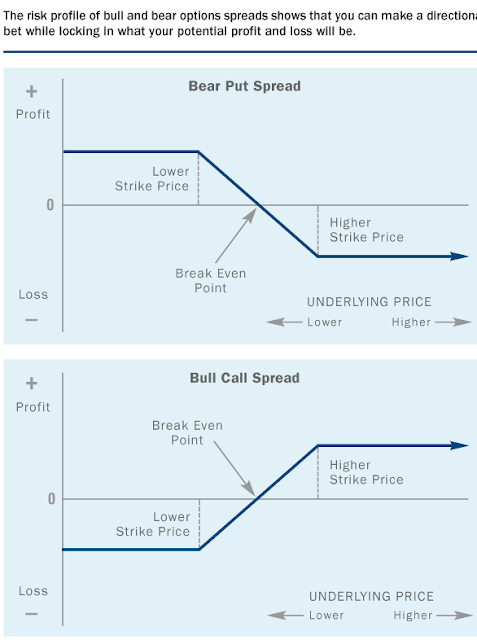 Bull call spreads and bear put spreads also are called vertical spreads because they occur in the same month and they have two different strikes. Unlike with the covered call strategy, your risk with the bull and bear spread strategies is more easily quantified, says Joe Burgoyne, director of institutional and retail marketing at the Options Industry Council. Options are excellent tools for both position trading and risk management, but finding the right strategy is a key to using these tools to your advantage. Beginners have several options when choosing a strategy, but first you should understand what options are and how they work. An option gives its holder the right, but not the obligation, to buy or sell the underlying asset at a specified price on or before its expiration date. There are two types of options: a call, which gives the holder the right to buy the option, and a put, which gives its holder the right to sell the option. A call is in-the-money when its strike price (the price at which a contract can be exercised) is less than the underlying price, at-the-money when the strike price equals the price of the underlying and out-of-the-money when the strike price is greater than the underlying. The reverse is true for puts. When you buy an option, your level of loss is limited to the option’s price, or premium. When you sell a naked option, your risk of loss is theoretically unlimited. Options can be used to hedge an existing position, initiate a directional play or, in the case of certain spread strategies, try to predict the direction of volatility. Options can help you determine the exact risk you take in a position. The risk depends on strike selection, volatility and time value. No matter what strategy they use, new options traders need to focus on the strategic use of leverage. Being systematic and probability-minded pays off greatly in the long run, instead of buying out-of-the-money options just because they are cheap, new traders should look at closer-to-the-money option spreads that have a higher probability of success. Example: If you are bullish on RELIANCE and want to use the NSE exchange, which is currently trading at 1024, instead of spending 15000 Rs on the JAN 1020 call looking for a home run, you have a greater chance of making profits by buying the JAN 1040/1060 call spread for 7500 Rs. Picking the proper options strategy to use depends on your market opinion and what your goal is. A market correction is typically defined as a drop in stock prices of 10% or greater from their most recent peak. If prices continue down to the point where they are down 20% or more, it is then called a bear market. · Stock market corrections occur, on average, about every eight to twelve months. · On average, a market correction lasts about 54 days. According to Fidelity (as of May 2010) Since 1926, there have been 20 stock market corrections during bull markets, meaning 20 times the market declined 10% but did not subsequently fall into bear market territory. If there was a way to “time the market” and figure out when it was going to go up, and then sell before a market correction occurred, well, who wouldn’t do that? It seems there is plenty of information on the internet that suggests this is possible. Let’s think about this: if you had this skill, would you be writing articles on the internet... or sitting on the beach somewhere with your laptop, drinking a Corona and making money? Most people lose money by trying to move their money around to participate in the ups and avoid the downs. This is a documented behavior which I discuss in Why Average Investors Earn Below Average Returns. As a professional financial advisor, when we build a portfolio, we expect that one out of every four calendar quarters it will have a negative return. We control the magnitude of the negative returns by selecting a mix of investments that has either more potential for upside, which comes along with more potential for market corrections, or a mix that has less potential for high returns, and also less risk. If you are going to invest in the market, it is best to understand that stock market corrections are going to occur, and it’s often best to just ride them out. Think of it like going to an amusement park; you can’t get on the roller coast only for the up, and avoid the big downs. That isn’t how the ride works. For almost every stock or index whose options trade on an exchange, puts are more costly than calls. Clarification: When comparing options whose strike prices are equally far out of the money (OTM), the puts carry a higher premium than the calls. They also have a higher Delta. · This is the result of volatility skew. Let's see how this works with a typical example. · SPX (the Standard & Poor’s 500 Stock Index) is currently trading near 1891.76 (but the same principle holds whenever you look at the data). The difference between $1,920 and $2,610 is quite substantial, especially when the put is 2 points farther out of the money. Of course, this favors the bullish investor who can buy single options at a relatively favorable price. On the other hand, the bearish investor who wants to own single options must pay a penalty when buying put options. In a normal, rational universe, this situation would never occur, and those options listed above would trade at prices that were much nearer to each other. Sure, interest rates affect option prices (calls cost more when rates are higher), but with interest rates near zero, that is not a factor for today's trader. So why are the puts inflated? Or if you prefer, you may ask: why are calls deflated? · As the strike price declines, implied volatility increases. · As the strike price increases, implied volatility declines. Over the years that options have been trading on an exchange (since 1973), market observers noticed one hugely important situation: Even though markets were bullish overall and the market always rebounded to new highs at some future time, when the market did decline, those declines were (on average) more sudden and more severe. "BUY VEDL 95 CALL @ 0.50 TGT 1.25/1.75"
"BUY ITC 300 PUT @1.40 TGT 2.20/2.90"
· To own stocks with less downside risk, compared with other stockholders. · To earn more frequent profits and to have fewer losing trades compared with other stockholders. There is a cost to gaining those benefits. Profits are limited. Therefore, it is not appropriate to adopt this strategy when you invest in companies whose stock price is expected to double every year. This strategy is for investors who want to earn good, but limited profits. 1. Buy 100 shares (or multiples of 100 shares) of a stock that you want to own. 2. Write (sell) one call option for each 100 shares. That call is "covered" because you own stock that can be delivered to the call owner, if and when you are assigned an exercise notice. NOTE: If tiy do not own the stock, then the call sale is "uncovered" or "Naked." 3. The cash (premium) that you collected when selling the call option is always yours to keep. 4. By writing the call, you agree to the terms of the option contract. In this example, you are obligated to sell that stock -- at the option strike price -- but only when the option owner elects to exercise his rights to buy your shares. 5. If expiration passes and the call owner does not elect to buy the stock, then the option is worthless and your obligations end. YFS (Your Favorite Stock) is currently trading at $43.80 and you buy 100 shares. Your outlook for this company is positive (that is why you are buying shares), and you hope to earn 10% to 15% per year as the company continues to grow. However, rather than just hold onto the shares, you adopt the covered call writing strategy with the hope of increasing your profits. There are always several choices for an option to sell. They come with different expiration dates and different strike prices. Let's assume that you choose to sell one call option that expires in 60 days (Mar 19, 20XX). Let's further assume that you are willing to make a commitment to sell the shares at $45 per share at any time on, or before, that expiration date.